An unrepresented litigant suffers from all sorts of disadvantages in court proceedings. Not having a grasp of the relevant legal principles is just the start. From not knowing formal etiquette, to simply being nervous speaking publicly, there's a host of reasons why anyone would be better off getting a lawyer. mounting a global attack on the justice system. I have never heard of either of these approaches working in a litigant's favour, and I don't expect I ever will. They often feature where somebody with no experience of the legal system tries to defend their own minor traffic charge. The problem with the first tactic is plain. A legal practitioner identifies many arguable issues and then concentrates their efforts on a few key areas. Identification of the most promising lines of attack requires experience, skill and judgment. Not knowing what might be important, an unrepresented litigant typically resorts to the 'shotgun' approach. This wastes the court's time and makes the hearing more confusing than it needs to be. It is not a mark of competent advocacy to pursue at trial every line of argument that can be imagined, regardless of its consistency with other arguments, and regardless of its prospects of success. On the contrary, such an approach is the hallmark of incompetence. The second approach is equally doomed. For obvious reasons, a judge or magistrate is unlikely to rule that every decision they have ever made or ever will make is legally invalid. It just seems improbable that anyone would decide that their career of choice is totally meaningless. Despite this, unrepresented litigants often persist with sweeping constitutional challenges that seek to dislodge the pillars of the Australian legal system. A recent example of both flaws in action is found in Moran v Police  SASC 269. The appellant was a truck driver who challenged a speeding fine given to him by a police patrolman. He was found guilty in the Magistrates' Court but took the matter to an appeal. In the Supreme Court the appellant relied on a number of reasons why the magistrate's decision should be overturned. He claimed he'd not been given the chance of calling his mechanic. He said the lower court should not have allowed the charge to be amended. He tendered a certificate showing his vehicle's speed governor had been operating correctly two years after the alleged offence. None of these arguments assisted him. The appellant was unable to resist the temptation to challenge the magistrate's jurisdiction. The appellant's first contention was that the court comprised of a single magistrate had no jurisdiction to hear the matter. This complaint is without substance. A breach of the Australian Road Rules is a summary offence and therefore hearing by a magistrate was appropriate. The Australian Road Rules are adopted into South Australian law as a regulation under the Road Traffic Act 1961 (SA). The offence created by r 21(2) of the Australian Road Rules is a summary offence by virtue of s 5(2)(a) of the Summary Procedure Act 1921 (SA). 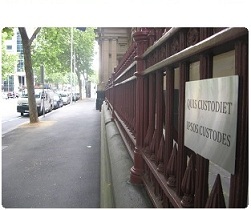 The appropriate court to hear the complaint was therefore the Magistrates Court of South Australia. The appellant's next complaint was that the speed device and the method of testing it by the police did not comply with s 10 of the National Measurement Act 1960 (Cth). Section 10 of that Act operates only when it is necessary to ascertain whether or not a measurement of a physical quantity has been made in the terms of Australian legal units of measurement. It does not in its terms set out a method of determining whether an Australian legal unit has been measured correctly in a particular instance. Nor does it displace the common law presumption of the accuracy of scientific instruments where the scientific instrument is notoriously accurate; see Jenkins v WMC Resources Ltd (1999) 21 WAR 393. Speedometers fall within the category of scientific instruments to which the presumption of accuracy applies; see Gray J in Pinkerton v Police  SASC 341, Redman v Khun (1979) 20 SASR 343 at 344 - 345. Vanstone J made similar findings about the scales and measurements argument in Van Reesma v Police  SASC 201 [at 20 and 21]. The operation of the presumption of the accuracy of scientific instruments was discussed in Such v Police  SASC 274, summarising the principles and drawing assistance from Police v Henwood  SASC 209 and Police v Bulgin  SASC 143. In Williamson v Hodgson  WASC 95 the appellant challenged his finding of guilt for speeding (89 km/h in an 80 km/h zone). He cited perceived bias, actual bias, contravention of the United Nations Covenant on Civil and Political Rights, his alleged seccession from the Commonwealth of Australia, the invalidity of the Magistrates Court, the invalidity of the prosecuting entity, and his refusal to be allowed a jury trial. He was unsuccessful on the appeal. By contrast, the accused in Police v Hicks  SASC 136 succeeded at first instance and again on the Crown appeal with a much more direct defence. It probably doesn't do justice to the accused's case to say that he simply denied the offence, but that was exactly what he did and the court was left in doubt about the charge, and dismissed it. there is case law that says that anyone who wants to challenge the accuracy of speed cameras should take their concerns to Parliament. In this case, they have cut out the middle-man. muppet, I'm interested to know the case you refer to. The media article you linked now has a legal segue: Such v Police  SASC 274. Apparently Bob Such had much the same result at his appeal as at the Magistrates' Court. After Dickson v The Queen, do you still say the courts aren't willing to shoot themselves in the foot, Doc? I think you should have said the High Court is an exception to your rule. Point well made, HC. Congratulations on the win. And a sequel to the sequel, Elucubrator. (Never as good as the original). In Such v Police  SASCFC 4 independent MP Bob Such has been three (or possibly four) times unlucky in his attempts to defeat an allegation he sped 19 km/h over the limit back in 2008. Dr Such now wants the High Court to consider the matter.